OTTAWA - Canada's top Mountie says the gunman who stormed Parliament Hill in 2014 would have had a difficult time pleading insanity had he lived to face charges. But RCMP Commissioner Bob Paulson acknowledges Michael Zehaf Bibeau could have benefited from mental-health counselling before the rampage that saw him die in a hail of bullets. A rifle-toting Zehaf Bibeau, 32, raced into Parliament's Centre Block in October 2014 after fatally killing Cpl. Nathan Cirillo, an honour guard at the nearby National War Memorial. Shortly before his attack, the gunman made a video in which he cited retaliation for Canada's military involvement in Afghanistan and Iraq as his motivation. Paulson told a Commons committee last year that the Mounties considered Zehaf Bibeau a terrorist, and that he would have been charged with terrorism offences under the Criminal Code had he survived. 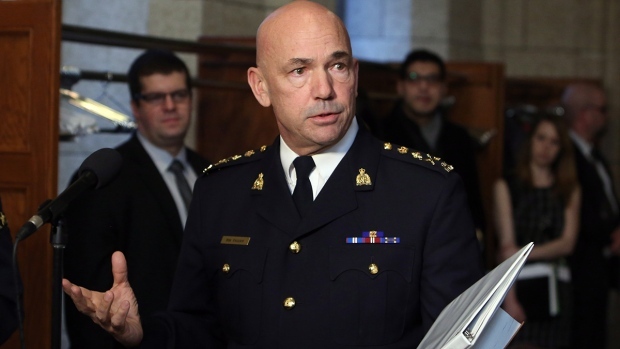 The commissioner told a security conference today that Zehaf Bibeau might have then blamed his actions on mental illness -- but Paulson doesn't believe such a breakdown was the main factor.